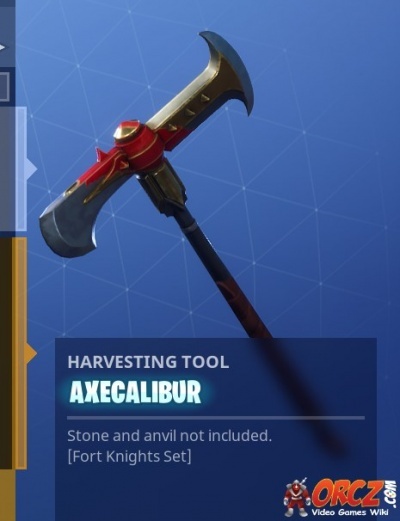 Axecalibur is the name of one of the Pickaxe Skins in Fortnite Battle Royale. "Stone and anvil not included"
This pick axe is a premium tier 35 Battle Pass reward. You have to purchase the Battle Pass and level it up to level 35. This harvesting tool is purely cosmetic and does not affect the speed in which you harvest resources. The name of this pickaxe is a play on words on the legendary sword of King Arthur, "Excalibur".